The Estrold Resort’s northwoods-style lodging is known for cleanliness, comfort, and superior guest services. There are 13 vacation cottages to choose from, depending upon the size of your group. On the grounds, covering 7.5 acres of large pines, the resort features a number of recreational facilities and activities for family members of all ages, and… nearby are many area activities and other recreational opportunities! Located on Little Saint Germain Lake, this beautifully scenic 960 acre lake has something for everyone. Fishing on our lake is great with plenty of Crappies, Walleye, Northerns, Muskies & of course an abundance of panfish. The lake also has some great open areas for your boating needs. Even go to dinner on your boat from the resort, or stop and grab some ice cream all on the lake. 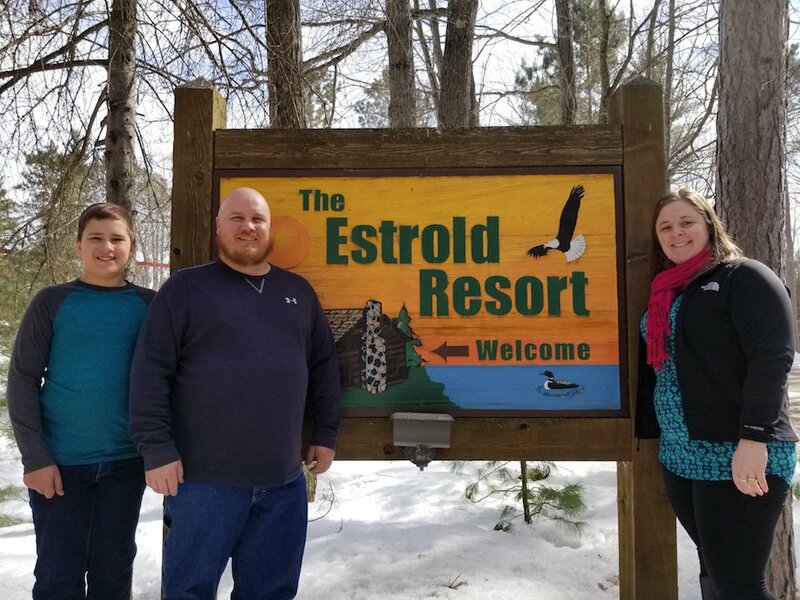 Amanda and Travis Fowler, along with son Kayden, are your new management for the Estrold Resort. Travis and Amanda previously lived in Malone, Wisconsin, just outside of Fond du Lac. They made the move to St. Germain in the summer of 2016 to fulfill their dream of living up in the northwoods. Since he was young, Travis vacationed up in the Conover area, over on Pioneer Lake, just north of Eagle River. Amanda vacationed here on Little Saint Germain Lake, right across the bay from the Estrold resort with her family. This area has been a home away from home for both of them in the summer and the winter, and they both wanted to make the move to enjoy the northwoods year round. Travis has been in the construction business for 22 years, and has been self employed with his Fowler Construction business since 2013. Travis has also done a lot of work already for the Estrold Resort to maintain the beautiful cabins here on the grounds. Amanda has been a teacher since 2009, and is currently a high school math teacher over at the Northland Pines School District in Eagle River. Amanda first did a lot of work helping with the cleaning of the cabins in the summer of 2017 . Amanda has helped at a few resorts in Door County over the years to help keep a clean, beautiful place for people to vacation. Both Amanda and Travis have a love for nature, enjoying boating, kayaking, and fishing in the summer, and snowmobiling in the winter. They look forward to continuing the traditions of the weekly summer potluck, s'mores roast, fishing derby, and gnome hunt. Amanda and Travis are excited to be experiencing this new adventure helping to maintain the beautiful area at the Estrold Resort. Take a little vacation right from your desk. We won't tell.